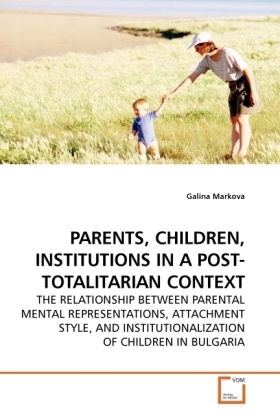 INSTITUTIONS FOR CHILDREN IN BULGARIA This text studies psychological and social factors that have led many parents to separate from their children placing voluntarily them in institutional care in Bulgaria during the communist regime. Like in all Soviet block countries the child welfare system was built according to the communist ideology of the state intervening in the family. This legacy presents a problem in the current efforts of transforming the child welfare system from institutional to community one. The study focuses on the relationship between mothers experience in childhood as reflected in their attachment style and mental representations, and their choice of different type of care for their own children (institutional, weekly and day care). The participants completed attachment style measures and wrote descriptions of their parents. Mothers who used institutional care for their children were the least secure of the three groups, their mental representations were the most negative, and most of them were raised in institutions. Mothers who used weekly care presented mental representations that were the least conceptually complex. Policy implications were discussed.